Universal Credit (UC) is designed to support people of working-age with their living costs when on low income or out of work. We understand that the change in benefit system can be difficult to get your head round. This guide should help to explain Universal Credit and how it could work for you. If you are feeling uncertain about your finances, please know that there are many professionals who will provide UC advice as well as general financial advice for free. Want to know what others think about Universal Credit? 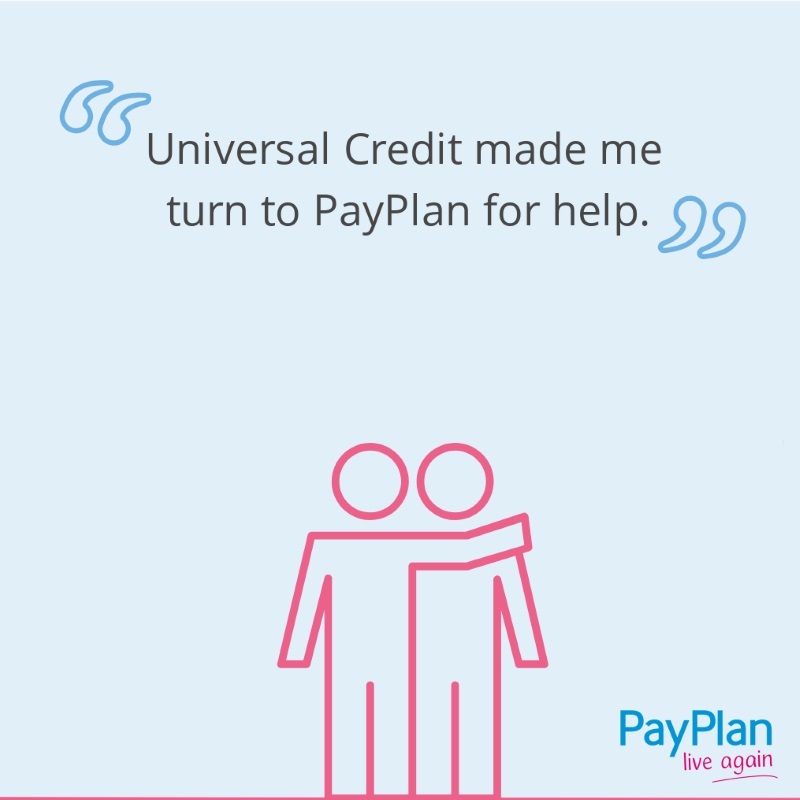 You can read about first-hand experiences from PayPlan clients who are either eligible or claiming UC here. When should my first payment come through? Will Universal Credit payments be enough? What is the Universal Credit contact number? How does Universal Credit affect my plan? Universal Credit is a single monthly benefit payment for people of working-age who are on a low income or out of work. It replaced the previous benefits system, where eligible benefits could be paid out weekly, fortnightly or monthly, depending on your individual claim. Now, with Universal Credit, recipients of multiple benefits get their entire entitlement in one lump sum, once a month. We cannot say for sure how Universal Credit will affect you as the amount each person or household is paid will be different. However, there are a few ways that UC could affect you depending on your finances and circumstances. A noticeable change from the old benefit system will be how frequently you receive your UC payment – you’ll only be paid once a month compared to weekly or fortnightly. This could prove to be an initial strain on your finances. Always seek advice before making a claim as there is usually no option to go back to legacy benefits. If you’ve never made a claim before and have a change in circumstance such as having a child, moving home or changing your work hours – you may be entitled to Universal Credit. Always seek advice before making a claim to make sure you are fully informed. Although we can’t tell you exactly how much you will receive, we can tell you what the standard, basic payments are for Universal Credit. UC is paid once a month, regardless of whether you are claiming by yourself or as a couple. For example: If you made a claim on March 1st you would then be paid UC on the 1st of every month. You should receive your first Universal Credit payment up to five weeks after your application has been accepted. If you need help with your living costs while you wait for your first payment, you can apply for an advance. Will my Universal Credit payments be enough? We cannot say for sure if your payments will be enough for you as everybody’s circumstances are different. However, Universal Credit is designed to help with living costs so it should cover this expense. When we asked PayPlan clients who claim UC, over half of the people we surveyed said they receive less money through Universal Credit than through the previous benefit system. you should keep a close eye on your finances to see if you have enough to cover your costs each month. If in doubt, seek advice. For Universal Credit help to apply, visit the GOV.UK website. If you’d like advice on other benefits, you can read our dedicated benefits advice page. If you are an existing client, think you are affected by the new benefit changes, and you’re worried about missing a debt plan payment, contact your PayPlan case officer as soon as you can. We’ll be happy to talk through your circumstances, and suggest ways in which we can help. If you are already claiming any of these benefits then your local benefits office will contact you in advance regarding your switch to Universal Credit, so look out for any correspondence from them as this is likely to contain important information. Contact your landlord and explain your situation – is it a temporary problem or are you going to struggle long-term? How much rent arrears are owed? You might want to complete an Income & Expenditure sheet to show exactly what your financial situation is. Remember, your rent is a priority outgoing compared to repayments needed for things like unsecured loans, credit cards, catalogues etc. There is no point prioritising your unsecured debts if it means you lose the roof over your head. Whether you have just applied for Universal Credit or your still getting used to the system; we’ve put together a few tips to help you budget whilst on UC. Be strict. The wait for your first UC payment could take up to five weeks, so be firm with your finances during the first month or two and ease yourself into the routine of monthly payments. Divide each payment by the number of weeks left until the next payment. This will help you figure out how much you can use as an allowance for each week. Get help with an advanced payment. This would help with your first month’s rent after applying. Discover how to apply, here. Prioritise essential bills such as rent. Shop around. Look at the bills you pay for and see if switching provider will give you a better deal. You may be able to save hundreds of pounds over the course of a year! Find out if you are eligible for a Budgeting Loan from the Government. This can help you pay for emergency costs. Check your council tax. You may be eligible for a reduced rate, so get in touch with your local council and see if you could save. PayPlan help 1000’s of people in debt every year. No matter your circumstances, we are here to help. If you need advice on Universal Credit debt, you can find out how to protect your finances by contacting us or use our online, free debt solution tool.